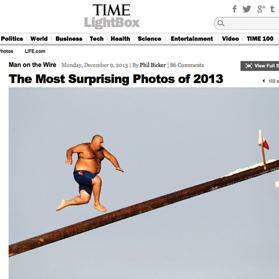 It has been named one of the most surprising photos of the year by Time magazine, and it has made it to the Wall Street Journal, The Sunday Times of London and to the BBC’s best pictures of the year. 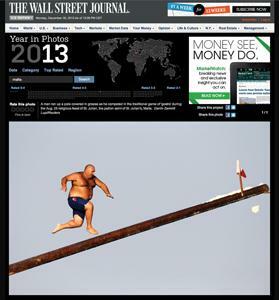 The photo of the Ġostra Man, as he wobbled his way up the St Julian’s greased pole taken in August by Times of Malta and Reuters photographer Darrin Zammit Lupi has been published in newspapers the world over: from Poland to Peru, Turkey to Taiwan, India, Italy and everywhere in between. The gravity-defying stunt of Daniel Caruana, known as il-Ganga, is still hitting the pages of major international news titles and he is still incredulous. 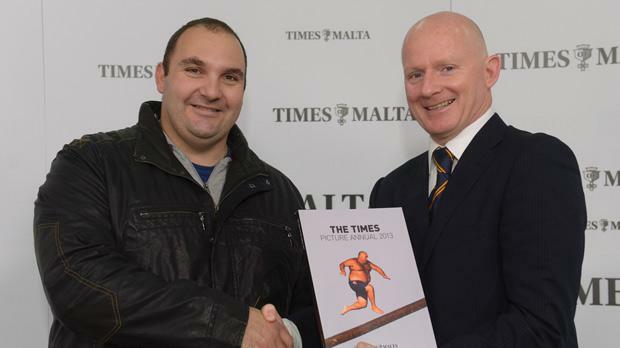 “Even friends from South Africa have been e-mailing me about it – I never imagined it would go so viral,” Mr Caruana said when he was yesterday presented a copy of The Times Picture Annual, which features the photo on the cover. When the picture went viral in August, Mr Caruana was being compared to Kung Fu Panda, a Dreamworks animated superhero character that revolves around an exceptionally agile panda adept at the ancient Chinese martial art. The 32-year-old oil rig worker, who travels often to Denmark, plans on running up the greased pole again next year. 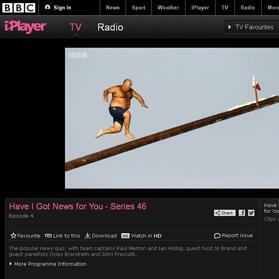 Whenever he is in Malta he never misses a beat and has been climbing the lard-covered pole since he was five. The ġostra tradition dates back to the time of the Knights and forms an integral part of the feast of St Julian’s. The timing is such that at the end of the ġostra, the participants rush up to the church to witness the grand exit of St Julian’s statue out of the church. Each year, the 65-foot long wooden pole is placed at an angle covered in 15 litres of lard and four flags placed at the very end. This year, the members of the ġostra club who organise the event hope to collect enough money to change the pole which has graced the inter-national media. “That pole is old now, and wear and tear is taking its toll,” Mr Caruana said.